#Badgers Happ has 2 assists today and 44 for the season. He had 44 all of last season. DAKOTA MATHIAS FORRRRRR THREE ???? Purdue leads 7-6 at the first break. All of the #Badgers ' points have come in the paint, but a couple of point-blank misses, too. Purdue leads 7-6 at 15:27. Boilers shooting 60%. UW 3 of 8 from the field. Purdue 3-5 shooting; #Badgers 3-8. Boilermakers have a 7-6 lead with 15:29 left in half. 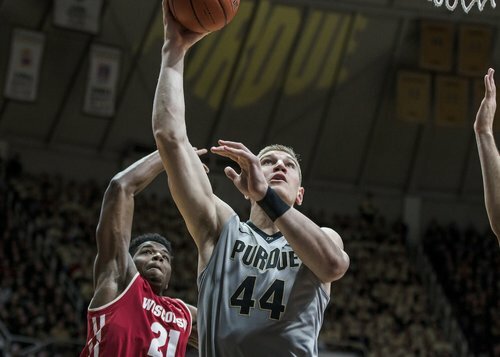 Happ (2 pts, 2 ast) blocks Swanigan to send us to media timeout. He already has a steal against him already today. Isaac Haas asserting himself early with a nice bucket in the paint ???? Purdue up 13-12 with 11:49 left to go until halftime. Neither team has led by more than 2 points. Six lead changes already. #Badgers have edge in paint points (8-4) but Haas is starting to take over in the lane. Purdue 13-12 with 11:49 left. Purdue leads 13-12. Boilers at 56% (5-of-9), Badgers at 36% (5-of-14). UW also with four early fouls. The #Badgers are 5 of 14 from the field, 0 of 3 from 3-point range. Shooting numbers: #Badgers 0-3 and 5-14; Purdue 1-3 and 5-9. #Badgers Happ is 1-5. Struggling vs. Purdue size inside. Six consecutive empty possessions for the #Badgers , who trail 15-12. Badgers have missed their last 5 FGs and are 2 of their last 10. Only trail by three thanks to 7 Purdue turnovers. Now eight empties in a row for the #Badgers . Plus, Hayes and Brown have two fouls. Still 8:26 to go in the first half. #Badgers ' Brown and Hayes out with 2 fouls apiece....8:26 left in half. Now 2 fouls on Haas - refs trying to keep control of this game from the jump. This game in one emoji: ???? The #Badgers are now 5 of 19 from the field, 0 of 5 from 3-point range. Still only trail 15-12 with 7:31 left, though. #Badgers haven't scored in 5:19, but down just 3. Keep punching fellas. #Badgers ' offense ugly. Just 5-19 shooting (0-5 from 3) but down only 15-12 with 7:31 left. Purdue in bonus.